Inversion involves being suspended upside down for therapeutic purposes. It is a known form of treatment that has proven to be effective for those who have back pain and other issues. When the body is turned upside down, the effects of gravity are temporarily reversed, decompressing the spine. In other words, inversion therapy changes the dynamics and uses gravity to help relieve tension from your spine. Why Is It Healthy To Invert? Everyday, our body is subjected to gravity. Standing, sitting, and even lying down—all of these positions put stress on your body, especially the spine. With inversion, you allow a brief moment for your bones and muscles to relax and decompress. The spine is temporarily stretched and relaxed, helping it recover. Inverting for just a few minutes regularly can alleviate pains in your spine. This is especially helpful for those who have sciatica, spinal stenosis, muscle pains, and herniated discs. Inversion therapy has helped many patients forego invasive surgery because their condition has improved from consistent inverting. Teeter is a US company built in the 1980s by Roger Teeter, who was convinced that inversion helped him recover from chronic back pains sustained from years of professional waterskiing. Nearly four decades later and the brand is still as strong as ever. 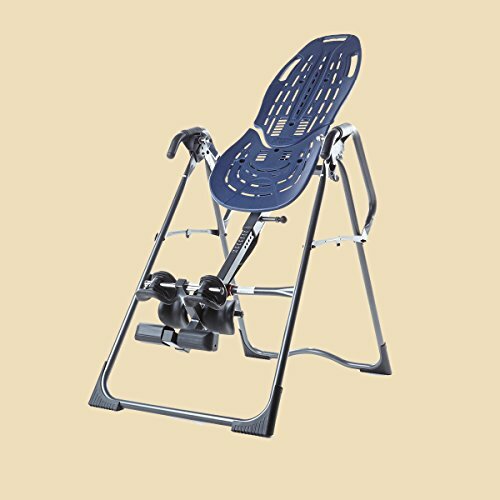 Teeter inversion tables are quite popular among enthusiasts because they are streamlined, easy to use, and very durable. Teeter is also the only brand to facilitate voluntary compliance and testing to consumer products safety standards. Their inversion tables are recognized by the Food and Drug Administration (FDA) to be a Class I medical device. Teeter also has the UL (Underwriter Laboratories) certification, which means it is independently certified for its durability, comfort, and ease of assembly. These certifications prove that Teeter is one of the most reliable brands in the market. 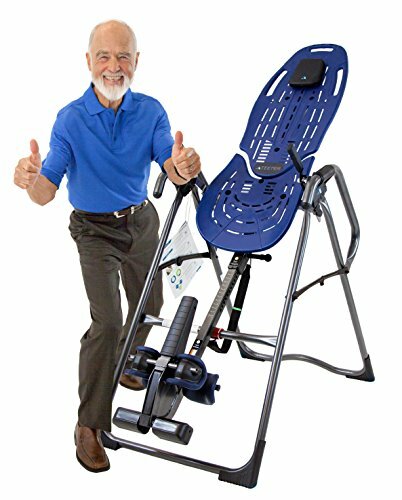 The Teeter Hang Ups EP 560 inversion table is a popular choice among customers nowadays. It delivers a great inversion experience and gives you great value for your money. 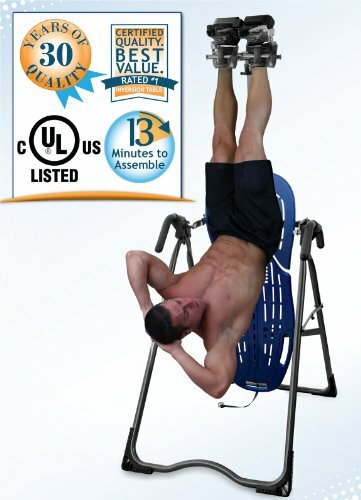 This inversion table may look a bit small and light than other models, but don’t be deceived. It is a top-end product that is stable enough to support users of virtually every size and shape. Even though it is a bit pricier than similar-looking models in the Teeter range, it is fitted with special features that distinguish it from other inversion tables. The Teeter EP 560 has a tubular carbon steel frame that will give a secure inversion experience. The frame is powder coated, which not only gives it a sleek look but also adds resiliency to the metal. There are non-skid stabilizers placed on the frame corners for extra security. This table is very secure and can easily accommodate weights of up to 300 lbs. The Teeter EP 560 features a ComforTrak Bed made of molded plastic. The upper portion has side handles for additional movement support. This backrest has no padding, so it may not be the most comfortable material to lie down on, but it does promote body slide for better stretching, which some foam cushions may not provide. There’s also a soft foam pillow attached with a Velcro strap that adds a bit of cushioning for your head. This table comes with a set of nodes that can be slotted into the plastic backrest. These nodes provide muscle stimulation and acupressure for your muscles. It’s important to avoid placing these nodes directly where they can press against your bones. The Teeter EP 560’s balance is one of its best features, because it is so easy and accurately controlled. The design comes with a tether or safety strap that can be used to pre-set the incline up to 60 degrees. In terms of ankle support, Teeter EP 560 is built with special Ergo-Embrace foam that snugly locks your ankles during inversion. It has a comfort dial that lets you determine the right fit depending on your ankle size. With the Ergo-Embrace technology, you are confident that every motion is secure. It also helps reduce any pain by distributing your body weight around your ankles. The ankle bar has a spring gear, which can be adjusted by pulling the T-Pin placed between your legs. The only drawback is that you have to bend over to reach the T-Pin, in case you need to adjust the ankle lock system. Still, it’s quite easy to adjust the tightness. The Teeter EP 560 measures 84” W x 86” H x 28.8” D and weighs 68.1 lbs. It can handle weights of up to 300 lbs, and you have to be at least 4’8” but not more than 6’6” to use the device. Assembling this unit is quite easy. It takes less than an hour to do so because some components are already pre-assembled. It’s only a matter of connecting the big parts together. The package comes with a manual, tools, and an instructional DVD to help you assemble the parts. If you prefer, you can even have it assembled for you. This unit can be easily folded and stored when not in use. The Teeter EP 560 comes with a 5-year warranty, and a 30-day money-back guarantee if you are unsatisfied with the product. Ironman’s ATIS 4000 is one of the direct rivals of the Teeter EP 560. Both inversion tables can provide satisfying results, but it’s useful to identify their comparable features. Aesthetically speaking, the EP 560 certainly beats the ATIS 4000. The former has an extraordinary design with the ComforTrak Bed where acupressure nodes can be installed. It is also made of durable and high-quality materials that offer stable inversion each time it’s used. The ATIS 4000 is just as stable as the EP 560 when used. It has an additional feature where you can lock into the angle you choose, which cannot be done with the EP 560. 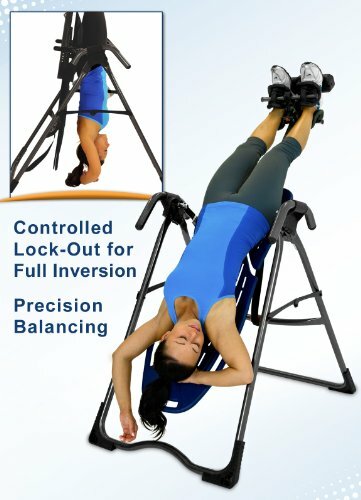 With this locking feature, users can perform ab exercises while inverting. Plus, many users say that the ATIS 4000 has more comfortable ankle support, very important to consider. But the EP 560 triumphs again with its pivoting mechanism. Compared to the ATIS 4000’s more primitive steel-to-steel rotating system, the EP 560’s gear is more streamlined and accurate in angling the user. Both the Teeter EP 560 and ATIS 4000 are amazing products worth the investment. If you are willing to spend a bit more for undisputed quality, go for the EP 560. Nevertheless, you can still enjoy a lot of features with the more affordable ATIS 4000. Since the same company manufactures both products, they are nearly identical in terms of quality construction and performance. The difference lies in the features. First, the EP 560 comes with a T-Pin system for its ankle lock, less user-friendly than the upgrade on EP 960’s EZ-Reach Ankle System where you don’t have to bend over to reach your ankles. The Teeter EP 960 has a better EZ Angle Tether Strap feature that enables pre-set angles of 20, 40, or 60 degrees. While the EP 560 may have an adjustable Angle Tether Strap, you can’t use it to pre-set angles. The EP 960 also has EZ Stretch Traction Handles that provide more stability during inversion. But what the EP 560 has that the EP 960 doesn’t is its compatibility with other accessories like the EZ-Up Gravity Boots. The EP 960 is not compatible with these accessories. So, as far as the two models are concerned, it’s up to you if the additional features that the EP 960 has justify the price difference from the EP 560. It all boils down to your personal needs and budget. As the first model in the ComforTrak series to offer extra-long Stretch Max Handles, the Teeter EP 860 supports more stretching options and makes it easier to return to an upright position. Like the EP 960, it also allows the user to pre-set angles to 20, 40, or 60 degrees. The EP 860 is also compatible with a range of accessories, including the EZ-Up Gravity Boots, vibration cushion, and acupressure nodes. Again, if you decide that these upgrades are worth the additional cost, then opt for EP 860. The EP 560 has other models, like the EP 560 Ltd. with Back Pain Relief Kit. 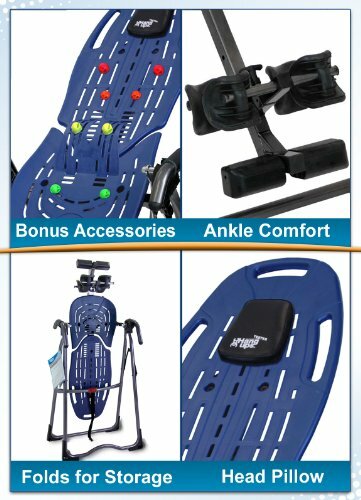 This unit comes with added accessories for acupressure and lumbar bridge support, plus a DVD on back pain relief stretches and exercises. 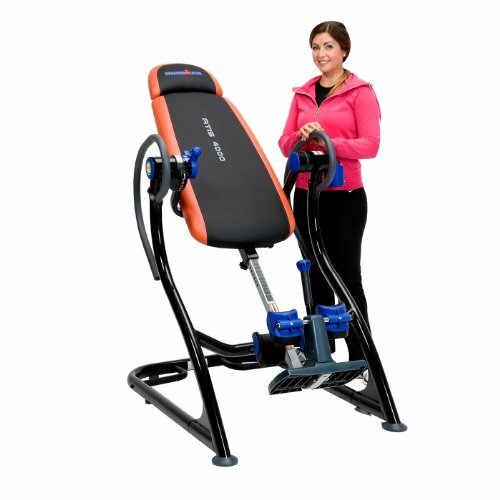 Overall, the Teeter EP 560 is one of the best inversion tables on the market today. Its precision, superior make, overall comfort, and functionality make it a popular choice among inversion enthusiasts who want to experience it at home. While the price is higher than some alternatives, you will be quite satisfied with the quality that this unit brings. Remember, investing in your health is always a good idea.